On Sale Now! Save 7% on the Galco V-Hawk Inside the Waistband Holster (Black), Kimber 3-Inch 1911, Right Hand by Galco at Freedom from Government. MPN: HWK424B. Hurry! Limited time offer. Offer valid only while supplies last. Galco's patented new V-Hawk tuckable Inside the Waistband holster reaches unheard-of heights in comfort, speed, stability and versatility. Galco's patented new V-Hawk tuckable Inside the Waistband holster reaches unheard-of heights in comfort, speed, stability and versatility. Constructed of premium steerhide, the professional-grade V-Hawk comes complete with both leather 11/2" belt loops and tuckable injection molded 11/4" C-Hooks. The wide spacing of the belt attachments lends excellent stability to the design. 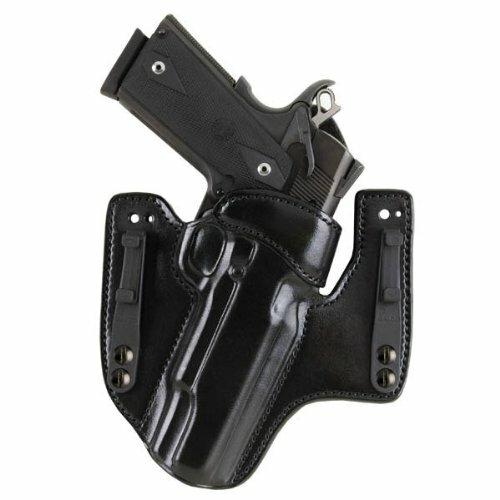 An open top offers both speed and ease of draw and the reinforced mouth offers an easy one-handed return to the holster. The included C-Hooks offer an incredibly low profile on the belt and further enhance the V-Hawk's already excellent concealability. The V-Hawk is currently offered for popular semi autos and double-action revolvers.